Soviet. Russian experimental Kalashnikov bayonet Afghanistan trialed. Up for the sale is a quite unique piece of Soviet Militaria. 100% original.This is a Soviet tri..
Austro-Hungarian M1891 straight slot Mosin/Nagant bayonet. For captured rifles. Up for sale is one of the most rare WWI period Mosin/Nagant bayonets.This bayonet was made by Autro-.. This particular knife is one of my favorite finds in all those years I am dealing with edged weapons..
Up for sale is a quite rare set of Danish M1915 bayonet with frog and knot.The bayonet itself is not..
Finnish M62 Valmet rifle bayonet. Fiskars made. We have several bayonets for sale, by buying one unit you are buying one bayonet.An original Finnish..
Up for sale aircraft crash damaged german paratrooper gravity knife part.Outstanding war groun..
German letter opening knife made from shrapnel with Iron Cross. Dated 1916. Nicely made German WWI souvenier or letter opener knife. Made from schapnel.Very nice and attra.. This is an interesting WWI period German trench knife.This is one of hybrid types that were inspired..
German WWI period Mosin/Nagant ersatz bayonet adaptor. Very rare and desirable WWI artifact.It would be a welcome addition to any bayonet or Mosin/Nagant r..
Up for sale German WWI period trench or fighting knife. 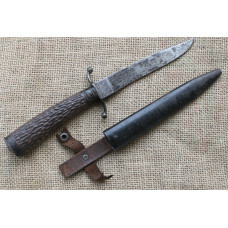 Rare dagger model with steel handleThis is a..
Italian knife for assault troops (Assaltatori). Model 1960. Very early date. 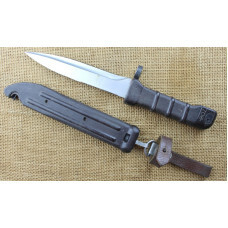 Up for sale is a quite rare and interestng Italian fighting knife.This is the model 1960 knife for a..
Several bayonets are available.Up for sale are model M1891/30 Mosin-Nagant rifle spike bayonet..
Swedish AK4 bayonet, German G3 clone. Stainless steel blade. We have several bayonets for sale, by buying one unit you buy one bayonet.Swedish AK-4 bayonet, the ..
Up for sale original relic from German WH officers scabbard.Ground dug found relic condition. check ..